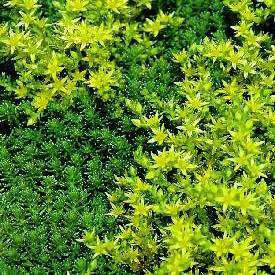 The creeping selections of Stonecrop are excellent groundcover plants, particularly for hot, dry sites with poor soil. This species forms a low carpet of tiny spiraling green leaves, spreading to form a thick patch. Tiny yellow star flowers appear in early summer. A fast grower, this is best kept away from slower alpine plants that it might smother. Also a good choice for tubs and mixed containers. Six-sided Stonecrop is easy to propagate; simply break pieces off and stick them in the ground. Excellent choice for a children's garden! Good winter effect, developing a bronzy-green color.